Yet another South African journalist dies. Her name was Suna Venter. She was one of numerous journalists to die this year so far, not unlike many countries around the globe. Just like the recent death of journalist Sarah Kershaw, who used to work for the New York Times. She exposed the CIA's MK Ultra operation, digging into survivors stories. Or investigative journalist, Liam Scheff, of 911, HIV, Fema, fracking and the CIA, amongst others. After dental work, he began experiencing a 'drill' and a 'siren' noise permanently in his ears, which eventually drove him to suicide. A handful of journalists who died from natural causes or 'medical' complaints? Hardly. In my opinion and from my observations, Suna's death was the work of Deep State and the mainstream media mafia. She, along with seven other journalists working for the SABC stood up in resistance to the government-run corporation. They were unhappy with the fact the organisation was choosing to stop airing footage of so-called violent protests. During the past year Suna was shot at, was on the receiving end of threatening phone calls, her flat was broken into and she experienced other harassment. I also believe she suffered harassment from electronic or psychotronic remote devices, which led to her untimely death at the age of 32. Officially, she was diagnosed by a doctor as having developed 'Broken Heart Syndrome', causing rapid heart muscle weakness. She eventually died in her flat from A so-called broken heart. But unofficially, I'm pretty certain she was targeted with a remote device. You know, the kind that are activated from a distance. 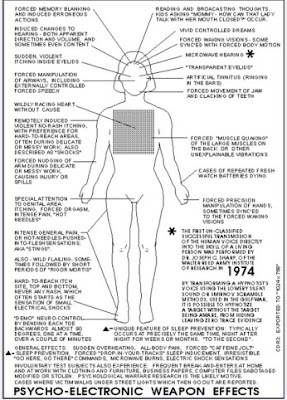 These might be any one or more of sonic, scalar, bioelectromagnetic and/or DNA weapons using sonic radiation or EM that are all undetectable. If she was the type of person that had researched such things, she might have carried a metal sheet with her to place across her chest. This acts to deflect weapons aimed at the heart and which could have saved her. Speaking from experience: the remote heart attack weapon can attack from a distance, invisibly; can send immense amounts of energy directly to the central chest region, creating a sense of congestion, pressure, and an impending heart attack; can send pencils or pulses of directed energy and subsequent pain sensations from above onto the left-side of the chest; can send pulses of directed energy from behind, near the spine; can send pulses of directed energy from underneath, near the left side of the chest, going up under the ribs; can send pulses of energy into the chest region also from the right-hand side of the chest. Deep State's 'silent weapons for a quiet war' include these in the CIA's 40's or 50's leaked document of the same name to the public. Basically, they've been refining their weapons for decades. One MD. a Finnish doctor, Rauni Kilde was given cancer by one of these devices. She was a global speaker on mind control, UFO's and reincarnation. She said her cancer was the result of beaming technology and scalar waver. Within 6 weeks she was dead. But not before sending a note to an annonymous person/friend, confirming how she had been hurt by a doctor in hospital. Back to our local Suna. Either way, 'heart problems', cancers, radiation burns, thyroid-related illnesses and much else can all be 'given' to the targeted individual (TI) from many metres away. Or through walls, from helicopters/planes and satellites, amongst others. Then, additionally, there can be the poisoning of gas or/and one's water supply in the home. These are just a fraction of Deep State's 'silent weapons'. Add to the mix the joys of synthetic telepathy. The same devices or waves beamed from towers used on religious zealots who 'hear God'. 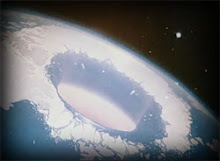 Or those who think they're channelling all sorts of beings from the Lighted realm – especially the ones at the top of the galactic and celestial hit parade. Many poor souls are fed continuous streams of abusive verbal garbage by this telepathy, have all sorts of nasty thoughts superimposed on their processes and live in a state of continous mental harassment. Implants can be transferred into the system physically or etherically. Through a handshake, via drinking water or dental work – as in Liam's case above, I believe, or can be transferred etherically through a handler or an unconscious 'agent'. Then there's Tinnitus, as it is medically known – which is continuous ringing in the ears. 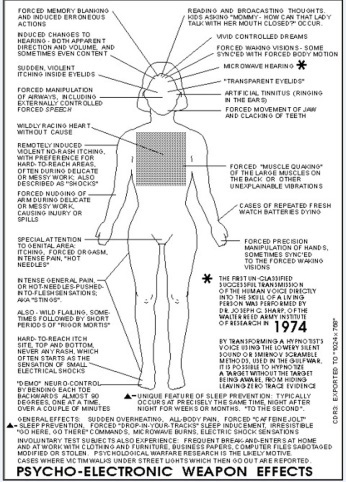 I would say that Tinnitus is in fact scalar mind control and a remote neural monitoring system combined. Many, many TI's complain of these ear/sound frequencies or ear ringing. For some people, the frequencies get worse when they make some type of personal progress. TI's thoughts, dreams, emotional states and frequency levels are constantly being monitored and TI's are therefore tracked. This, apart from regular dream insertions and their superimposed thoughts disguised to look like your own. At the extreme end are the mass murderers, serial killers, lone gunmen, many of whom state they heard voices telling them to do their respective heinous deeds. Or they say they heard God tell them to do it. These ones were also likely set up with other programming prior to these events. Sleeper cells, I think they're known as. You know your own mind. So test yourself on these, if you suspect this is what maybe happening to you. Depending on who's being targeted, there could be any amount of mental, emotional and physical symptoms brought on by a wide range of devices, used for various purposes. Though all share the same thing in common: to attempt to destroy the lives, bodies and minds that they beam their weapons to. Their objective is that you, one way or another, take yourself out. Unless you're important enough in their perception to be a more serious threat like some of the abovementioned folk were. However, if you don't accept this and choose to survive, they'll try to make your life as nasty as possible. They may ensure you are removed from your place of work and do all in their power to make sure you can never find work again. They may prevent you posting on the internet or being able to reply to jobs, while simultaneously randomly preventing the sending/receiving of your email. Ditto Skype and your cell phone. Other tactics may be to prevent payment for work that's owed you, accessing many companies. Or perhaps they might just massacre the hard drive of your computer altogether so you have minimal access to the net. This all might sound dismal, but...there's always a loophole. Even if you have made a contract to experience this at some level for whatever the reason, you still have the power of choice in your response. This is your free will gift from God. Once you give in to fear – especially if you are gang-stalked or subjected to psychic/spiritual attacks – you have opened the door wide to these agents. FEAR=False Evidence Appearing Real is the opposite of what you want. *Make the most of each and every day – live it as though it were your last. Really LISTEN to the birdsong, smell a flower, marvel at someone and something. And then...bless each and everything and thank God for your experiencing of it. Including you! You are living life - in the ways you can. For every uncomfortable day's worth of experience, you can find these many other blessings to balance it out with. *Anger, depression and the need for revenge (against your perpetrators) are all low frequency responses. These persons/psychopaths and their invisible parasitic equivalents, the dark forces, feast on such low frequencies. And why it is IMPERATIVE that you immediately take yourself up into the higher, lighter frequencies. Start singing one of your favourite songs, out loud. Or sing it to and for God, within you. Re-member one of the happiest times in your life or a beautiful memory that evokes love. Repeat. Do something that really stimulates your passion. Watch/listen to your favourite comedian for 10 minutes – have a good, all encompassing belly laugh. If you're a physically expressive person, start dancing to music you love. 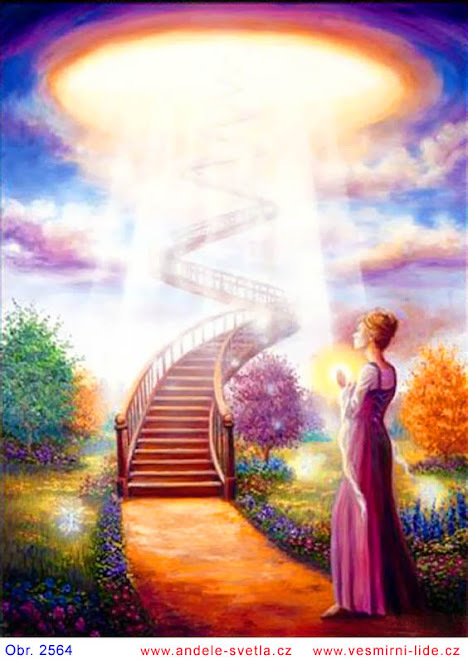 Depending on what you came to earth to experience and who you are as soul, you will have varying degrees of protection from God and His Lighted emissaries. Besides your Guardian Angel. Whether we're conscious or not of it, we're all on a journey to living God's will, life and heart through us. And we're at different places on the journey. I'm particularly thinking here of those who haven't been inclined towards God, but may consider themselves spiritually open seekers or Truthers. I'd like to suggest that you call on God for His guidance and protection. Asking daily for the protection is imperative. Ask Him to bring you His Lighted specialists to protect you at all the levels of your being. There are experts on everything in the higher dimensions – if it exists on earth, there are invisible beings that can help heal/counter it. May each and every one of you that I've encountered, and the many more I haven't, be blessed in the peace and protection of God. And may you find the ways and help that will ease, soothe and centre your body, mind, heart and spirit.